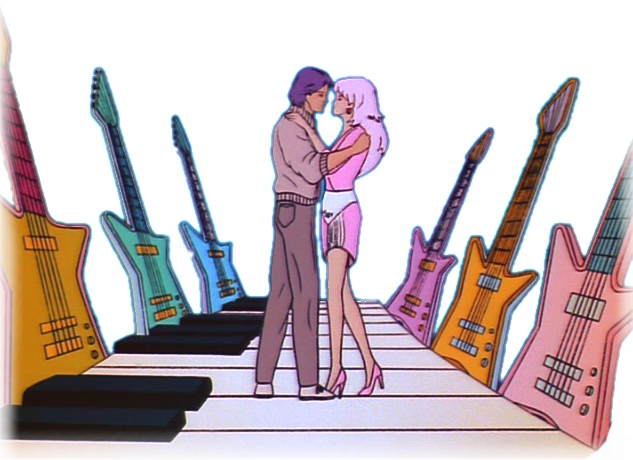 The main theme of the Jem cartoon is after all music, and the bands playing it. So why not take a look at what all the outrageous music is supposed to be played on? The cartoon aswell as the doll line presented some creative designs of instruments, some of which are inspired by real life instruments, and some that are assumingly unique designs considering I can't seem to find anything that corresponds with them. Although common instruments like guitars, synthesizer and drums are most in focus, this series is after all about the music industry so we get the chance to see all kinds of other instruments, like saxophones, pianos, different kinds of horns, maracas and more. Cartoon: The instruments of the characters was, for some reason, not among the top priority of things to keep track of, and would not match the doll line completely and would change within the cartoon. 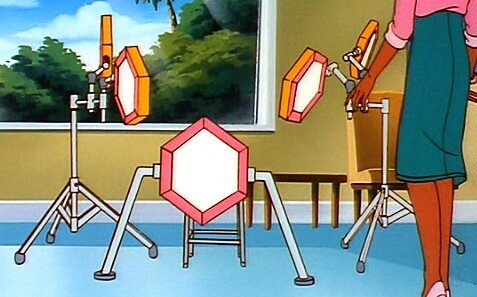 Some instruments change after the first five episodes to resemble the doll line. But several of them don't really resemble them anyway, and in some cases it's not even the same instrument. 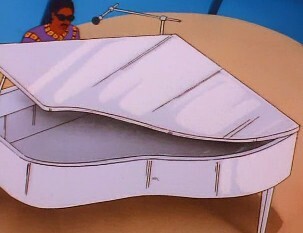 And characters who do usually atleast play a certain instrument in the cartoon, are sometimes seen playing something else, perhaps because of bloopers. Doll line: The doll line guitars are of course miniature plastic accessories for the dolls. The first year doll instruments had stickers on them, glittery or holographic. The second year doll instruments were transparent with glitter inside. And the Music Is Magic fashions also came with instruments with stickers on. Although most of the guitars aren't completely realistic in terms of things like matching the amount of tuning pegs with the amount of strings, they are still quite beautiful pieces. There were Mexican and Spanish variations aswell, some of which you can see on this page. The Mexican ones were transparent with glitter but had a transparent sticker at the same time. 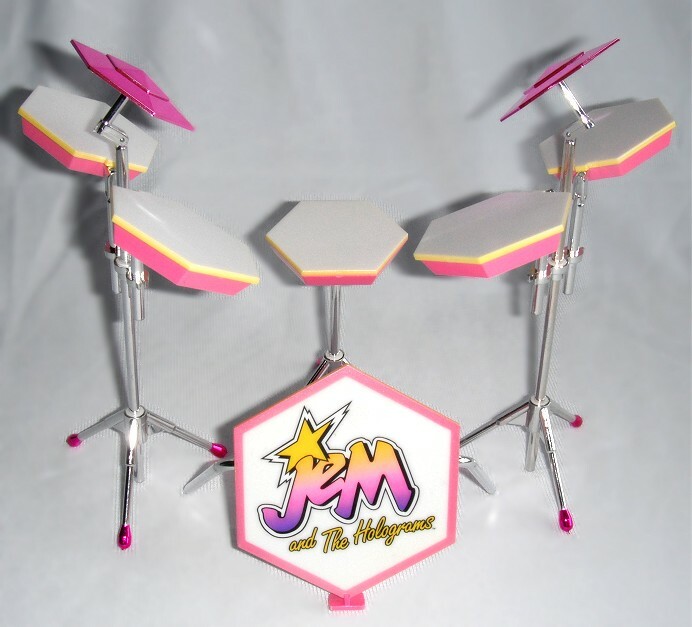 When the Jem dolls made their comeback as a collector series by Integrity Toys, the instruments were made alot more realistic with strings on the guitars, and other details that weren't just printed on a sticker. 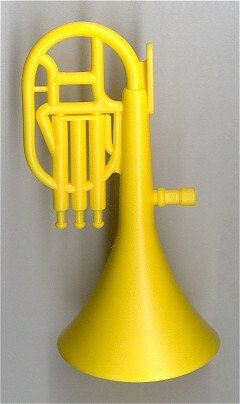 Hasbro never released instruments larger than doll size, other than the fact that two playsets were made in instrument shapes. The KJEM guitar looked like a guitar, the Star Stage like a synthesizer, and the waterbed was an actual working mini-synthesizer. 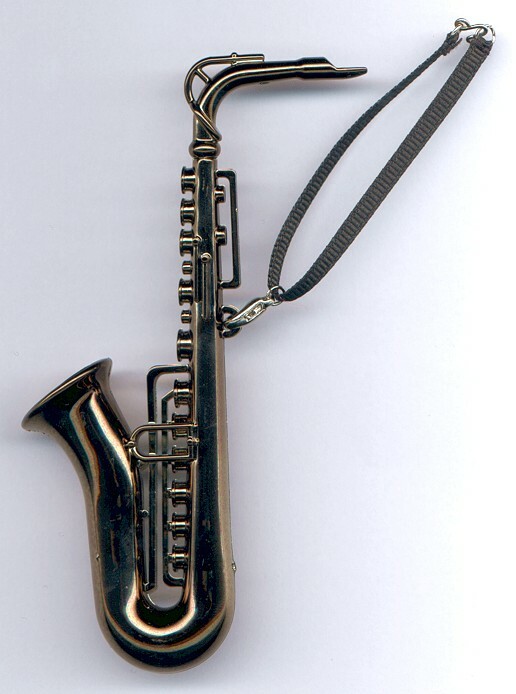 There was atleast another company that released a non-official saxophone packaged in the style of Jem. This page will cover what each main character has played in the cartoon, aswell as their doll instruments, a look at some other instruments in the cartoon and doll line, and a little about what musical talent the characters have. As mentioned, there are lots of variations and bloopers, and I will only mention those quickly to not confuse you. And I'll try to improve the images later. 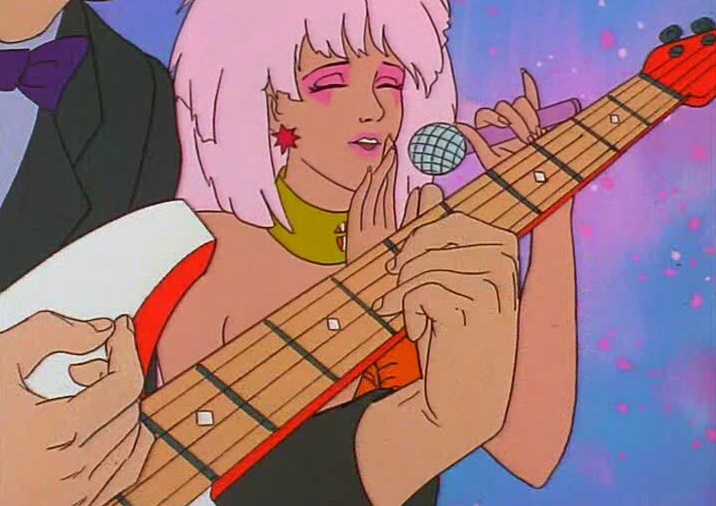 I'm going to mention Jem here although she doesn't really play any instruments in the cartoon, but she was originally intended to be a guitarplayer aswell as singer according to original art, and she does mention in the episode "The Talent Search Part 1" that she can't play drums. But she can actually play guitar according to the Jem Bible by Christy Marx. In the 2015 live-action movie she actually plays guitar. 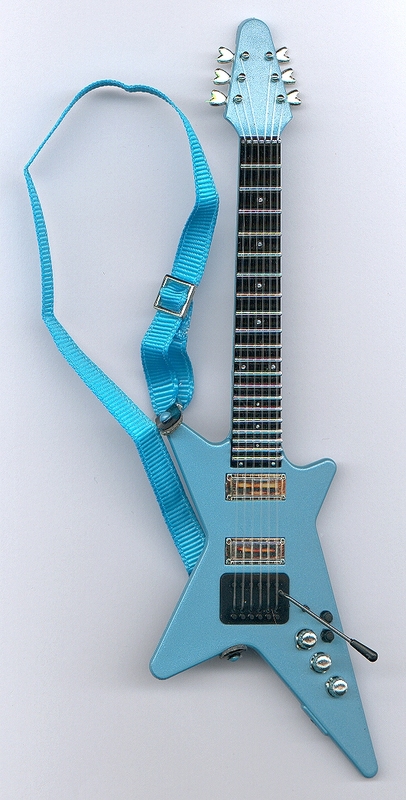 This is the first look at the guitar Jem plays in the movie. According to Imdb.com this is a Gibson model designed by former Ozzy Osbourne guitarist and Black Label Society frontman Zakk Wylde. First appearance: "Jem The Movie" 2015. Also Rio can be seen playing a guitar in the cartoon, aswell as singing, but you'd have to be attentive to catch it. And he is after all the roadmanager who sets things up for Jem and the Holograms. He knows everything there is to know about musical equipment, taught by Emmett Benton. Also Minx taught him some synthesizer building. This is only seen in a music video, "Deception". Rio only builds this, but he probably isn't planning on playing it himself. First appearance: "A Change Of Heart". Being the song writer for the band, it's a good thing she knows her way around instruments aswell to make the music come alive. Infact she is brilliant with any kind of instrument in existence. Although she usually plays her synthesizer (or keytar in the doll line) she can atleast also be seen playing a regular guitar in the first episode "The Beginning" and atleast holding Aja's guitar on stage in the episode "The Battle Of The Bands", and actually playing a acoustic guitar in a flashback in the episode "Scandal" and playing an electric guitar in the episode "Father's Day". Although in the episode "The Jazz Player" she says "what good is a guitar if you can't plug it in?". On the packaging of the 1987 Music Is Magic fashion Rock 'n Roses, you can see Kimber pictured wearing the fashion and holding a guitar. In the 80's UK comics, Kimber is once seen playing a guitar, but also her keytar. This is what Kimber plays throughout the entire cartoon, regardless of what the doll line released. 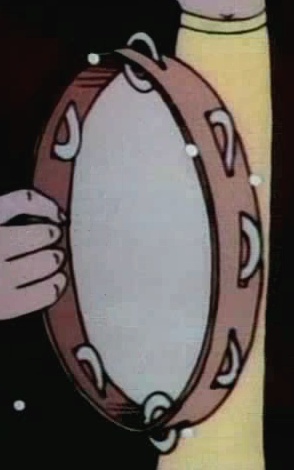 It gets broken in several of the cartoon stories, but then re-appears in the next episode. An alternative for the new Integrity Toys line, to give Kimber what she played in the cartoon. 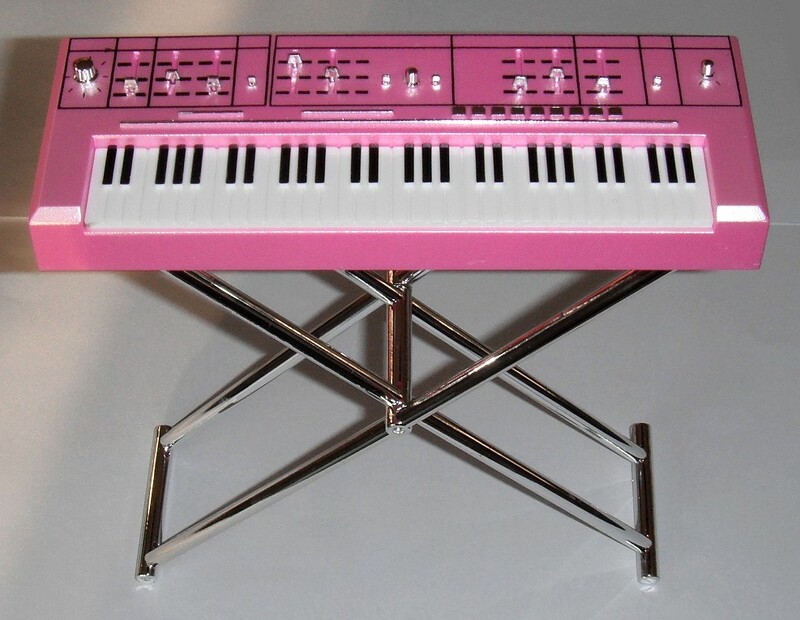 It's not directly based on the look of the cartoon keyboard, but it's a pink standing keyboard. 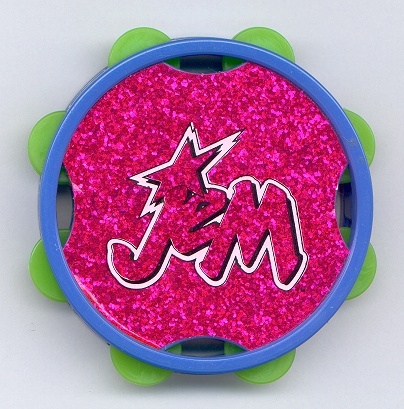 Has that "M" on top from when Jem was still called so. First appearance: First edition Kimber doll. 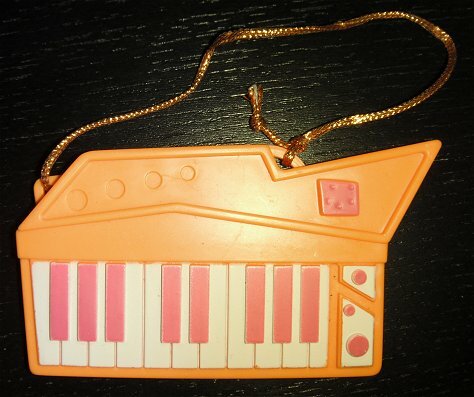 Second edition doll keytar kept the same design. 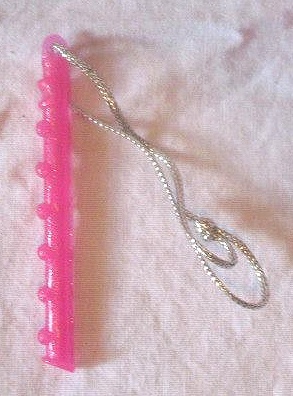 Transparent pink with glitter inside. First appearance: Second edition Kimber doll. 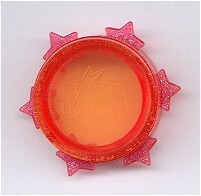 A slightly differently colored transparent pink with glitter inside. First appearance: First edition Mexican Kimber doll. Looks more like it's shape is based on Stormer's yellow keytar, than anything Kimber ever played. This is neither a standing keyboard nor does it have the "M" at the top. It's a completely new design, which happens to be mirrored in this particular art. A first look at what she plays in the movie. Aja is the lead guitarist in the Holograms, and the only guitarist until Shana changes instrument from drums. Aja's guitar seems to be based on a Carvin V-220, reversed, except for the head. Aja and Pizzazz seem to have each other's guitars in the first 5 episodes, by the look of the shapes. 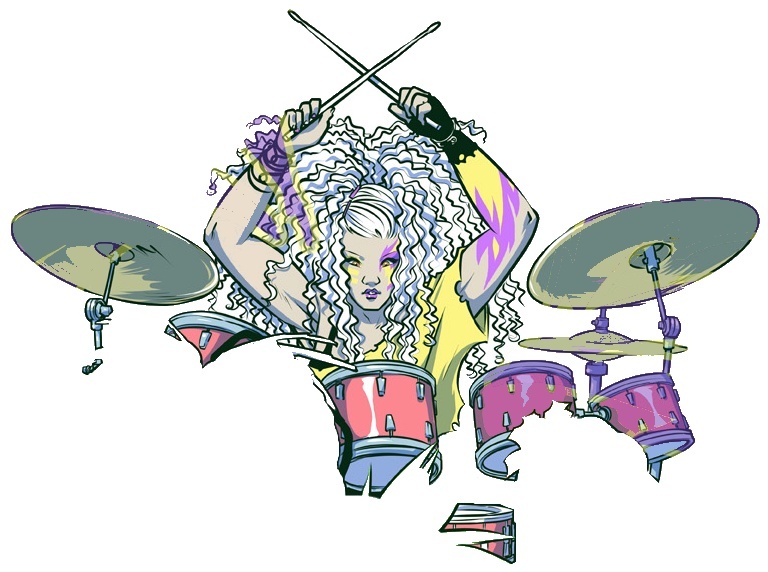 In the episode "The Talent Search part 1" Aja says she is hopeless on drums, which is funny because originally she was meant to play drums in the Holograms, which early artwork reveals, and before that she was going to play synthesizer. In the 80's UK comics, Aja once plays a standing keyboard. In the new comics by IDW Publishing, it is said in her bio that she plays drums and piano, and that she has a limited edition caribbean blue Les Paul Supreme guitar. In the 2015 live-action movie, Aja plays bass guitar and drums. 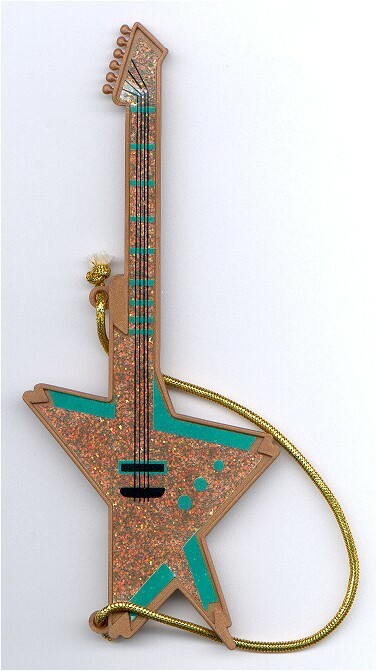 This guitar was actually supposed to be Pizzazz' guitar, but Aja had it in the show intro and the first 5 episodes. It gets broken in the first episode "The Beginning" but then re-appears in the next episode. White with dark pink neck. Also seen in bright pink with gray neck. And also surprisingly seen in it's correct later shape, already in the "The Battle Of The Bands" in the music video "She's Got The Power". An alternative for the new Integrity Toys line, to give Aja what she played in the cartoon in the first five episodes. Aja switched her guitar back with Pizzazz now. This guitar seems to appear in several different colors in a commercial bumper aswell, as seen on top of this page. First appearance: "The Battle Of The Bands" in it's new shape but previous colors, and "Starbright Part One: Falling Star". First appearance: First edition doll. First appearance: Second edition doll. A new design, with a similar look to it. 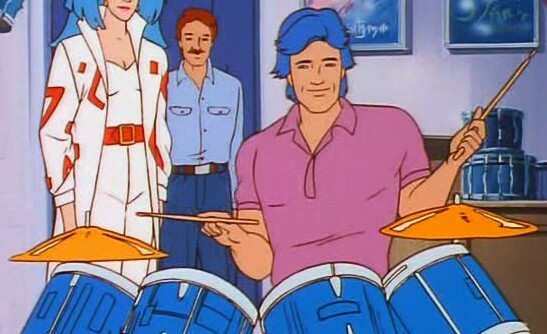 She was originally meant to play guitar in the Holograms, and the doll came with a guitar, and according to the cartoon storyboard she was meant to play keyboard for a while, but from the first episode she is on drums. However in the episode "The Talent Search Part 1" Shana picks up Aja's guitar and says she misses playing guitar, she leaves shortly for a designer career and then when Raya joins the band and takes over on drums and Shana returns, Shana is able to play guitar. Shana's doll guitar seems to be a B.C. Rich Mocking bird, and also somewhat resembles a "Siggi Braun Blackbird". On the packaging of the 1987 Music Is Magic fashion Electric Chords, you can see Shana pictured wearing the fashion and holding some sort of a keyboard, so perhaps she plays that too. In the 80's UK comics, Shana is seen playing guitar rather than drums. The same looking drums as Raya then takes over. A more common kind of drums with a color that matches her hair. A cool and apparently unique design. Makes you wonder where they came up with such a design if not based on anything in the doll line. First appearance: First edition Mexican doll. Raya is the current drummer of the band, and that's the only instrument we see her play, although she is a natural on any kind of percussion instrument. Raya's mother didn't really think playing drums was something a young lady should do, but her father always encouraged her and is the one who told her about the Talent Search. It seems like Raya took over Shana's drums, since the drums Raya's had before, looked very different than what she plays in the Holograms. On the packaging of the 1987 Music Is Magic fashion Rhythm & Flash, you can see Raya pictured wearing the fashion and holding a tambourine. 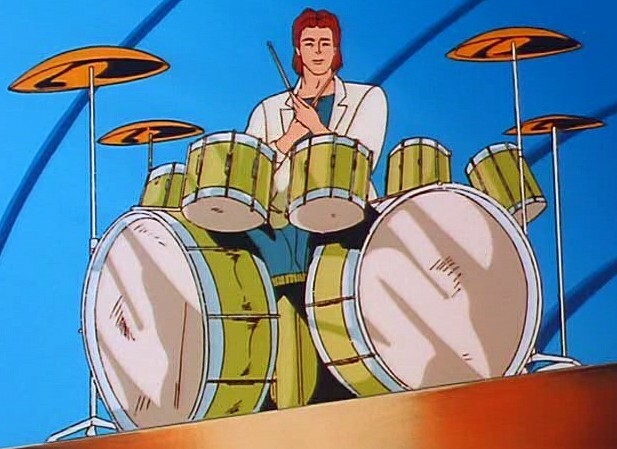 First appearance: "The Beginning" as for the drums themselves, and as for Raya playing them "The Talent Search Part 1" (according to the story), and "Scandal" (according to episode production numbers). First appearance: Second year doll. Pizzazz doesn't just sing in the Misfits, she also plays guitar which adds to her wild image. Aja and Pizzazz seem to have each other's guitars in the first 5 episodes, by the look of the shapes. 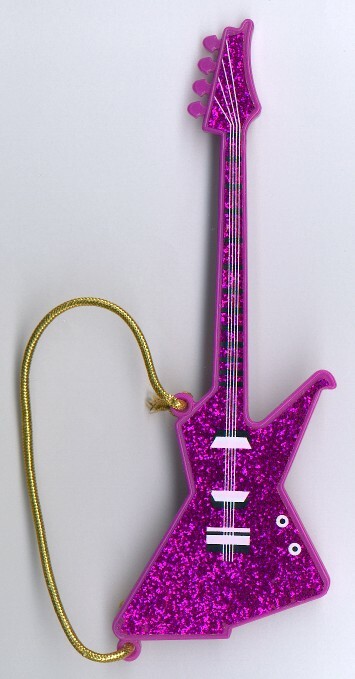 Pizzazz doll guitar is the only doll guitar that has tuners on two sides of the head, until the Integrity Toys Aja guitar. Pizzazz' guitar somewhat resembles an AX360 or even a B.C. Rich Virgo. She has also been seen playing a different looking pink guitar in the original cartoon intro. 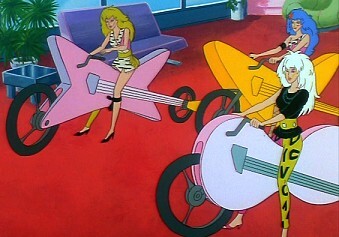 Then in "The Beginning" she drives a guitarshaped motorcycle, which is seen in white or pink and resembles her first pink guitar (later Aja's guitar). Then in the music video "Outta My Way" she plays a guitar that resemble Aja's first cartoon guitar in colors, but not in shape. In the 80's UK comics, Pizzazz once plays a guitar shaped as Roxy's from the cartoon. 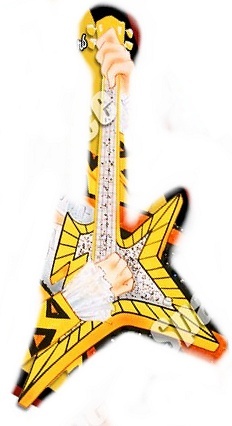 This guitar was really meant to be Aja's, and resembles the Aja doll's guitar in shape, but is played by Pizzazz in the first 5 episodes. 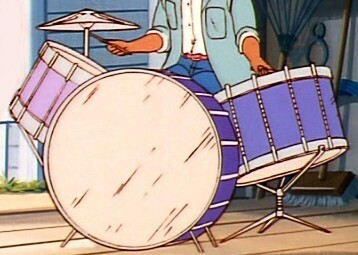 Also played by Stormer in "The Battle Of The Bands". Also seen as pink with gray neck. Pizzazz switched guitar with Aja now. This one resembles the doll version a little more now in color also, but strangely most of all the doll line's Spanish variation which was pink with a holographic sticker. In the cartoon episode "Starbright Part Three: Rising Star" she smashes it to pieces. Also played once by Stormer in "One Jem Too Many". First appearance: "Starbright Part Three: Rising Star". A new design in purple, apparently inspired by her regular guitar. She is the regular guitar player in the band. Originally she was meant to play drums though. She has also been seen playing Stormer's keytar in the original cartoon intro. In "The Beginning" she drives a pink guitarshaped motorcycle that looks like the guitar she then plays in the music video "Outta My Way". 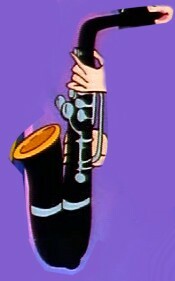 She has also been seen playing Pizzazz' first cartoon guitar in the episode "Disaster", aswell as purple/yellow drums in the episode "Danse Time". Roxy's established guitar seems based on a Ibanez Destoyer DT, and also somewhat resembles a Gibson Explorer or a Snakebyte. In the 2015 IDW Publishing comic, she plays drums, based on the blooper in the 80's cartoon episode "Danse Time". In the 80's UK comics, Roxy once plays a guitar shaped as Pizzazz' from the cartoon. The Misfits never had a drummer, and we never find out why she was on drums here. Although she was never meant to play drums, but did so in a blooper, here she becomes the drum player the band was missing, with a more common kind of drums. 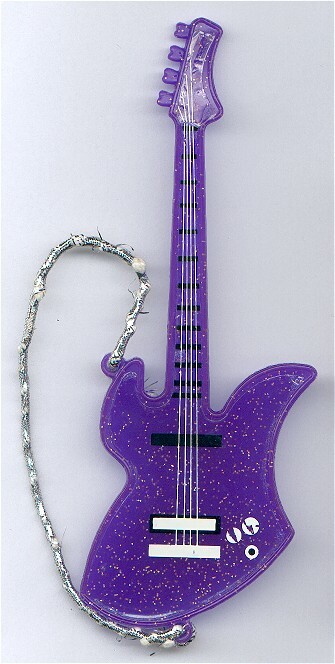 Also seen shaped as Pizzazz' first guitar (Aja's guitar) in the episode "The Battle Of The Bands". Pink with gray neck and changes to pink with yellow neck in "Starbright Part One: Falling Star" and all pink in "The World Hunger Shindig". Early plans for Stormer was for her to play bass guitar. 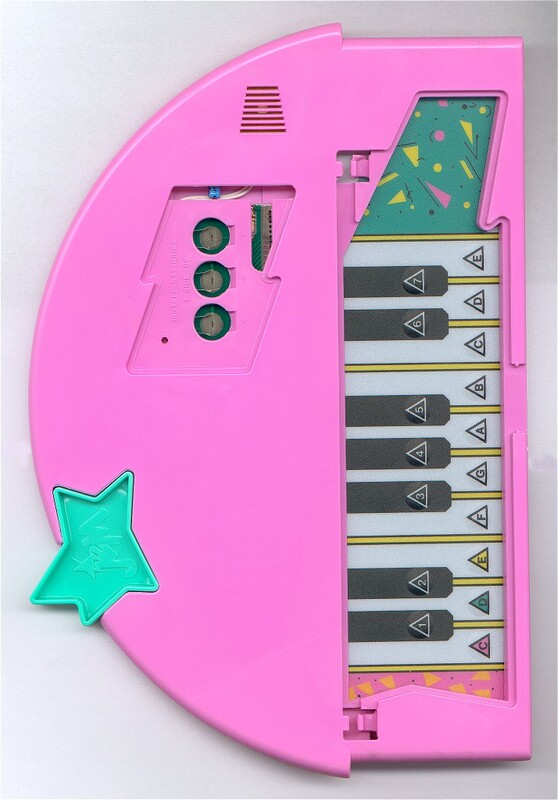 Stormer got a keytar in the cartoon, but a guitar in the doll line which seems based on a Roland G-707. Atleast they're all yellow. But she was seen playing a pink guitar in the original cartoon intro, and holding a pink one in "The Battle Of The Bands" that looks like Pizzazz' first guitar. In "The Beginning" she drives a yellow guitarshaped motorcycle that looks a guitar she then is seen playing in the music video "Outta My Way". 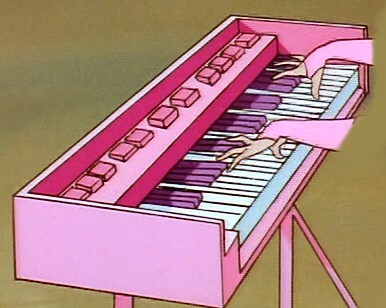 Then she also plays Pizzazz' second cartoon guitar in the music video "Congratulations" in the episode "One Jem Too Many". In the episode "The Stingers Hit Town Part Two" she plays an acoustic guitar at home. Also played once by Jetta in "One Jem Too Many". Not too far from her regular keytar, except for the new color. What a cool idea to make the new misfit a saxophone player, which added a new sound to them. Originally she was meant to play bass guitar, but ended up as the saxophone player. 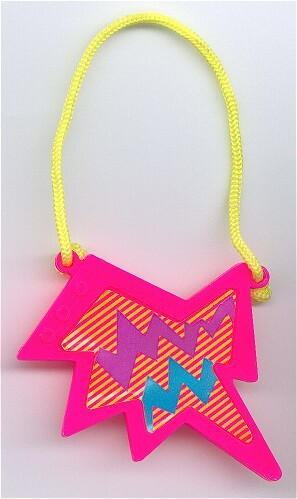 She has also been seen playing Stormer's yellow keytar in the music video "Congratulations" in the episode "One Jem Too Many". 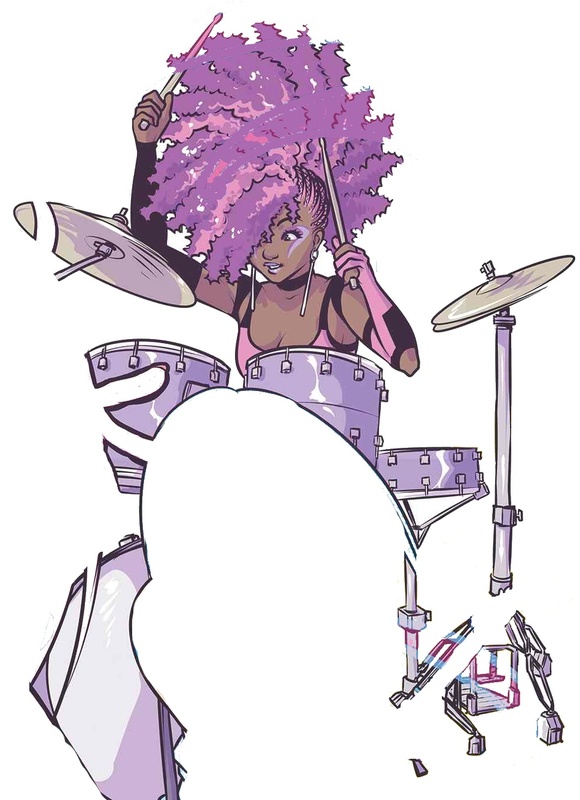 In the new 2015 comic by IDW Publishing Jetta plays bass guitar, and originally in the 2015 comic they wanted her to play drums, because a saxophone was so 80's, but since they had turned her black, they didn't want the black character in each group to be placed in the background like that. First appearance: "The Presidential Dilemma". Jetta becomes a bass guitar player with a guitar that matches her style. Maybe she would have a greater chance of finally joining the Misfits if she was more musically skilled. Unfortunately she doesn't have any musical talent at all, except for clashing her cymbals togheter, which seems to cause more disturbance than music. Instrument: Distortion modulator, not really an instrument. Originally he was meant to play an instrument called a "SynthAxe", which was a synthesizer-guitar. Other than being the singer of the band, he also plays guitar sometimes, and can also play piano/synthesizer. The doll guitar was to have the same shape as Shana's doll guitar. He's also been seen in some unidentified perhaps official artwork with another kind of yellow guitar. In the cartoon we first saw him with a guitar in the episode "Riot's Hope", where he was seen in present time with a black guitar and in the past with a yellow guitar, the latter which was chosen for release with the 2013 Integrity Toys doll. First appearance: Was to be released with the 1988 doll. First appearance: Was to be appear on the doll box art of the 1988 doll. She is the regular guitar player of the band. But she also has an interest in all kinds of odd instruments. 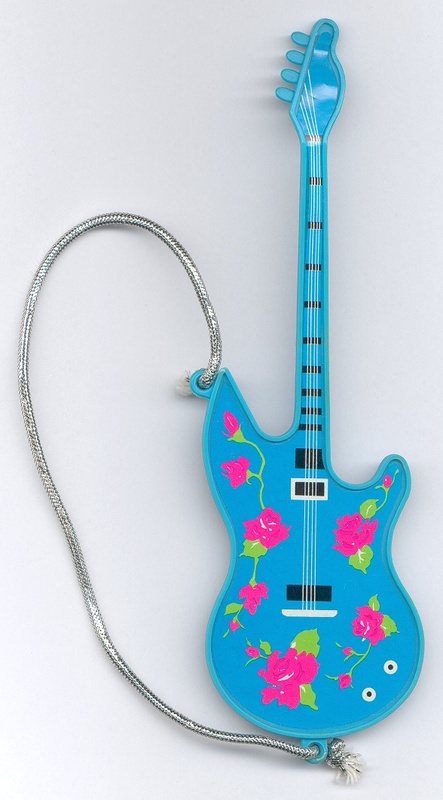 The doll version was to have the same shape as Roxy's doll guitar. 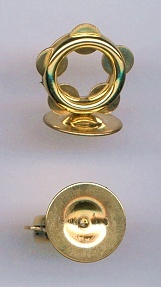 Rapture was also seen playing a tambourine in the episode "Riot's Hope". Appears quickly in the music video "It's A Hard, Hard Life". First appearance: "The Stingers Hit Town Part One". Minx knows everything about all the brands of synthesizers, and how to build them, which a great part of the episode "A Change Of Heart" tells the story of. Her own synthesizer is called Entropy, and she uses it to make sounds for instruments like drums, guitars, keyboards, horns, woodwinds, and even non-instrumental sounds like birds, howls, the wind or anything. 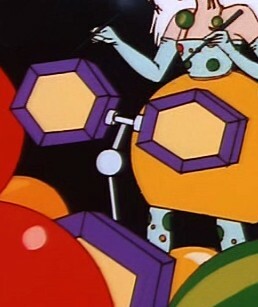 The doll was actually going to come with a tambourine, which is funny because only Rapture was seen playing one in the cartoon ("Riot's Hope"). Minx is also seen playing Rapture's guitar in the music video "Now" in the episode "The Stingers Hit Town Part Two". The name "Entropy" was actually to be used in the movie Chrity Marx was planning, where it was more than an instrument and actually a powerful masculine counterpart of Synergy, played by the musical duo "The Mongrels". 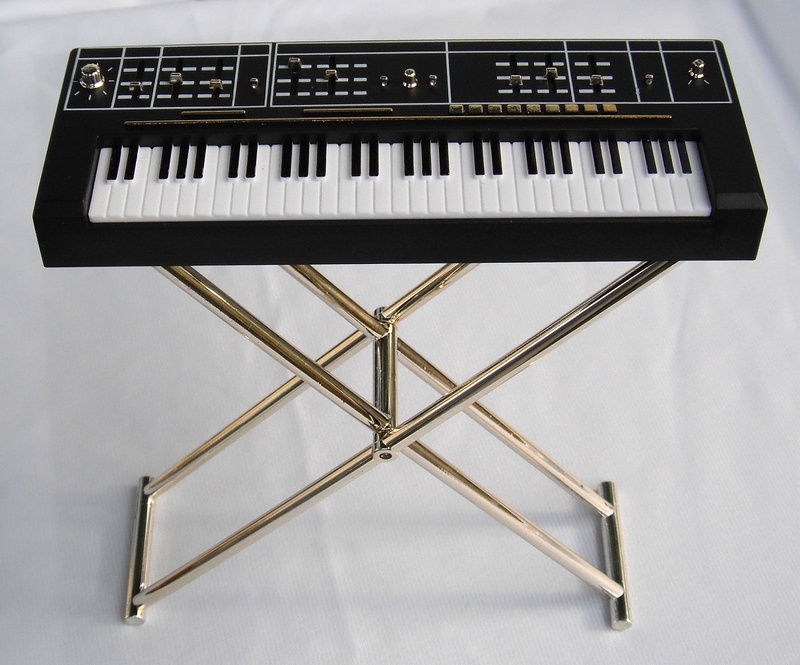 This single synthesizer is shown in atleast three different looks, one which resembles the Integrity Toys doll one, before she ends up with her double one in the cartoon. 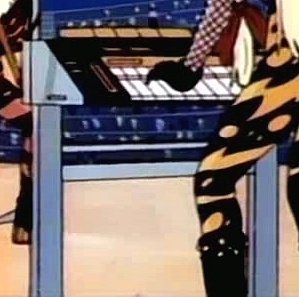 More resembles the synthesizer Minx played in the episode "Riot's Hope", than the one she is usually seen with in the cartoon. On the packaging of the 1987 Music Is Magic fashion Splashes of Sound, you can see Video pictured wearing the fashion and holding what's probably a guitar, so perhaps she plays that. On the packaging of the 1987 Music Is Magic fashion Electric Chords, you can see Danse pictured wearing the fashion and holding a guitar, so perhaps she plays that. The Starlight girls play in their own band or atleast practice some times, dreaming of their own band. Deidre is seen playing a guitar that is shaped as Shana's doll guitar in the episode "The Music Awards Part 1". 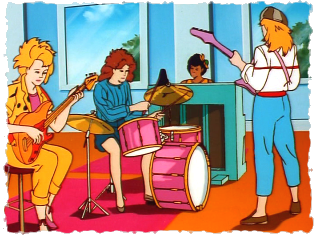 And in the episode "The Jem Jam Part 1" they play the Holograms' instruments, Becky plays Kimber's synthesizer, Lela plays Shana's drums, Deidre plays Aja's second cartoon guitar, and then also Ashley is playing Aja's second cartoon guitar for a moment. 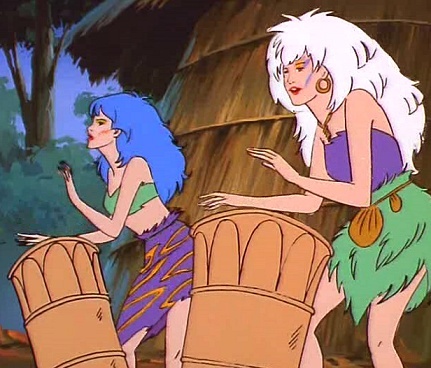 Then in "The Jem Jam Part 2" they strangely not only changed instruments to more regular versions, but also Lela and Becky has changed instruments with each other, and Ashley plays guitar. 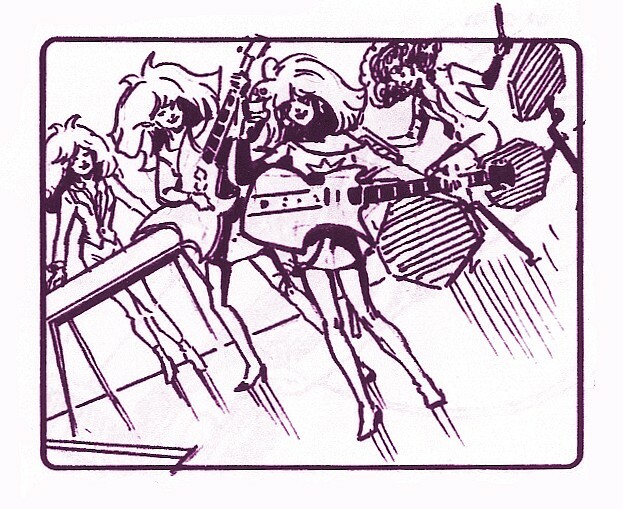 The Jem cartoon included other bands, and also other temporary instruments for the multitalented main characters. Also to come, is a view of some of the instruments Emmett Benton left for his daughters. Appears on a flyer for the Talent Search. First appearance: "The Talent Search Part 1". 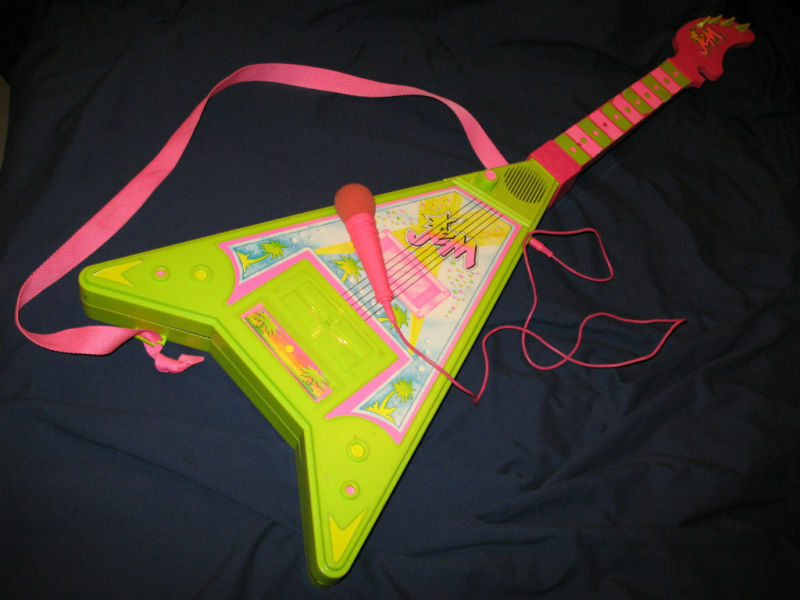 Was contributed by Jem and the Holograms to the Rock Hard cafe, but was never actually played by any of them, was it? Seen in what is probably Jerrica's bedroom. First appearance: "The Stingers Hit Town Part Two". This was only for a certain music video theme, Welcome To The Jungle. First appearance: "Welcome To The Jungle". 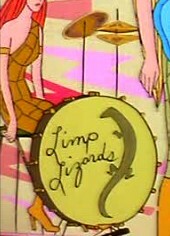 The Limp Lizards performed in two episodes, "The Beginning" and "The Bands Break Up". And the animators were very consistant about what character played what and even kept the same color though they were secondary characters. First appearance: "The Jem Jam Part 1". 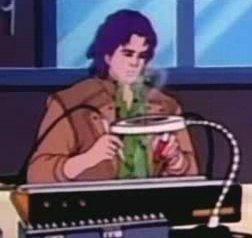 First appearance: "The Jem Jam Part 2". First appearance: "Glitter and Gold". First appearance: "Journey To Shangri-La". First appearance: "The Jazz Player". This is props from the Beauty and the Beast rock opera Jem and the Holograms and the Misfits appeared in. First appearance: "Beauty And The Rock Promoter". These are the instruments that came with fashions or playsets of the doll line. Some of these images are not close-ups of the instrument alone, but you get the idea. Shape is based on a Steinberger. Four strings. No tuners. First appearance: Second year fashions Music Is Magic. Only three strings. But four tuners. Four strings. Yet six tuners. First appearance: Second year playset Video Madness It's Workin' Out. First appearance: Second year playset Video Madness Love Is Here. First appearance: Second year playset Video Madness Show Me The Way. First appearance: Second year playset Video Madness Welcome To The Jungle. First appearance: First year playset. First appearance: Second year playset.